Crusty dragon Miss Drake has a new pet human, precocious Winnie. Oddly enough, Winnie seems to think Miss Drake is her pet — a ridiculous notion! Unknown to most of its inhabitants, the City by the Bay is home to many mysterious and fantastic creatures, hidden beneath the parks, among the clouds, and even in plain sight. And Winnie wants to draw every new creature she encounters: the good, the bad, and the ugly. But Winnie’s sketchbook is not what it seems. Somehow, her sketchlings have been set loose on the city streets! It will take Winnie and Miss Drake’s combined efforts to put an end to the mayhem... before it’s too late. Miss Drake, on a shopping excursion for some new tea and biscuits, also buys Winnie a new sketchbook that may be more that it appears to be, and when Winnie starts to sketch all the marvelous, magical creatures she is discovering, the sketchbook releases a magic all its own and the sketches come to life! It is up to Miss Drake and Winnie to find the sketchlings before they are discovered by both the magical and nonmagical worlds. Putting this all down, A Dragon's Guide to the Care and Feeding of Humans sounds like a typical middle grade adventure story, but what took me completely by surprise was that the story is just as much about love, loss, and the importance of family as it is about anything else. Amidst all the magic and missteps and adventures in the story is a growing underlying theme of the importance that both friends and family can have in a person's life, where friends become family and family become friends. The conclusion is one of the most touching endings to a book that I have read in a very long time, and made me think fondly of those that I have loved and lost in my life. The connections between Miss Drake and Amelie, Winnie and her father, and eventually Miss Drake and Winnie are made so incredibly real in such a short book. Laurence Yep and Joanne Ryder have crafted a beautiful and fun-filled story, and Marie GrandPré's accompanying illustrations are perfect. I would recommend this to anyone with or without a young person in their life; anyone will be able to enjoy this whimsical tale about the strength and love of families. Highly recommended. 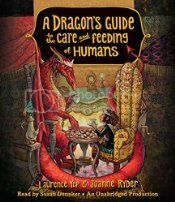 A Dragon's Guide to the Care and Feeding of Humans is published by Crown Books for Young Readers and will be available March 10, 2015.